Shares of Plug Power have been all over the map in the last three years. Here's what investors need to know in three simple charts. A Plug Power GenDrive unit on a Raymond forklift. Image source: Plug Power. Plug Power (NASDAQ:PLUG) has been one of the most volatile and impressive stocks of the past three years. The company came out of almost nowhere to become a leader in hydrogen fuel cells and infrastructure. But there are still a lot of questions outstanding about Plug Power's business and whether or not the stock is a good investment. Here are three charts investors should keep in mind when analyzing the stock. 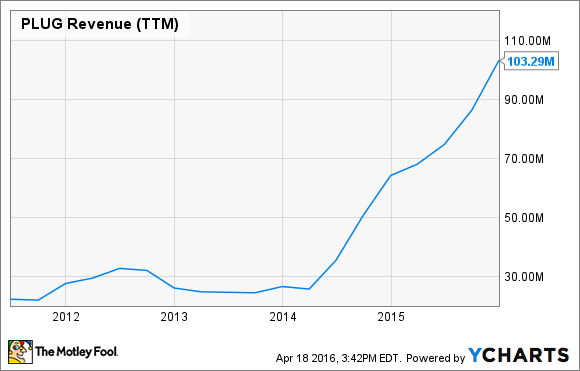 There's absolutely no question Plug Power's revenue, which is surging since mid-2014. A few big contracts, namely from Walmart, have caused a surge in GenDrive revenue and ongoing service revenue. While growth can't be ignored, the amount of money Plug Power makes on each sale should be scrutinized -- and the numbers aren't encouraging. In the fourth quarter of 2015, Plug Power lost almost a quarter for every dollar in revenue it generated. You can see below that free cash flow and net income have both been plunging just as revenues have been rising. 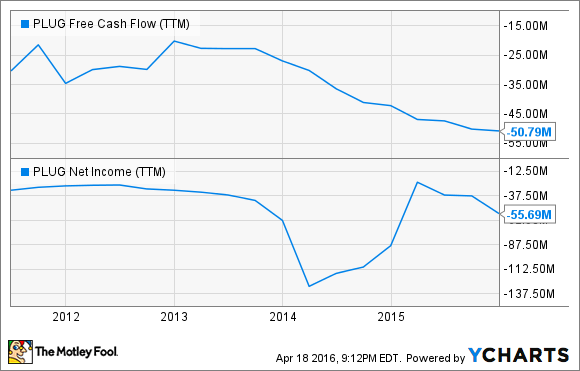 PLUG Free Cash Flow (TTM) data by YCharts. It's not unusual for a company to invest a lot of money in capital expenditures, sales, and other expenses when it's growing, but what should be concerning is that Plug Power isn't even generating a positive gross margin. In 2015, the company reported a gross loss of $9.9 million on $103.3 million in revenue. That's what drove the $47.3 million loss for the year, and that's what should be really concerning for investors. I mentioned above that Plug Power is a controversial company for investors; this chart shows exactly what I mean. Until early 2014, there was very little short interest, or trading of the stock for that matter, and since then, the short interest has surged as well as the percentage of shares sold short. 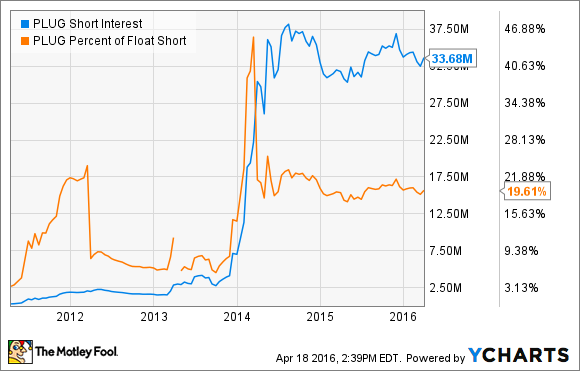 PLUG Short Interest data by YCharts. There are a lot of investors betting against the company's success, and that's worth considering before you get too bullish on this stock, especially with the financial challenges I pointed out above.